Email Marketing is one of the most important aspects of online advertising and every business owner, no matter of the scale of the industry, should employ email marketing service provider company in order to reach out to people all over the world, which will automatically increase their traffic and income. After all, earning great income is the initial view of any business owner. If you are new in the business world, then you need to understand that having an email list of your regular visitors will immensely help you get a huge traffic on your website. 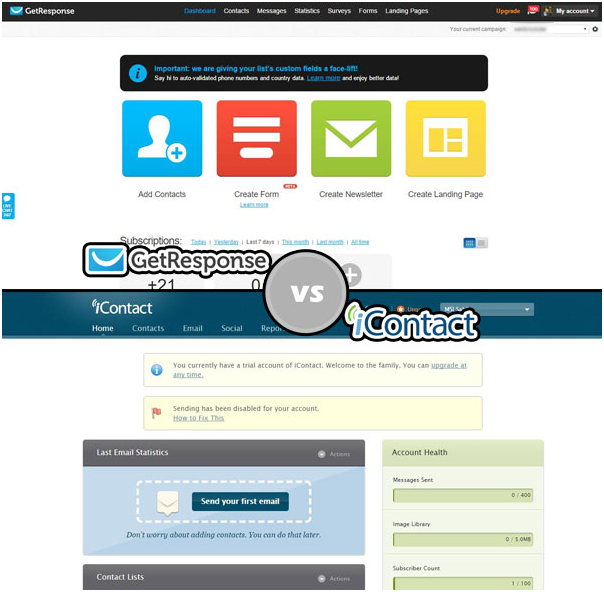 There are many email marketing service provider company out there, however, today we will only be discussing on Getresponse and iContact as these two are the most popular and effective email marketing tools used in recent times. There are many scenarios that you you need to know about these Email marketing platforms, which I will expand in details. So let’s get started. GetResponse has a very friendly welcome interface when you visit their website, which shows its number of consumers, number of operated countries, amount of subscribers and some links to their features. There is also a video which shows how easy it is to get started with GetResponse. By scrolling down you can find many testimonials, featured on along with offer for free trial and some other video tutorials in the front page of GetResponse. On the other hand, iContact has a very professional welcome interface where a sales person is dealing with his female client. By scrolling down you will find features, awards, video testimonial, offer for free trial etc on the front interface of iContact. Before jumping into the price, let’s have a look of free trail plans of both GetResponse and iContact Email service. Here is the chart to make the comparison easy for you. Pricing of premium plans starts at $15 per month in case of GetResponse. On the other hand, iContact has a starting price of $14 per month which is $1 less than GetResponse. So does is mean iContact is cheaper than GetResponse? No, not yet. 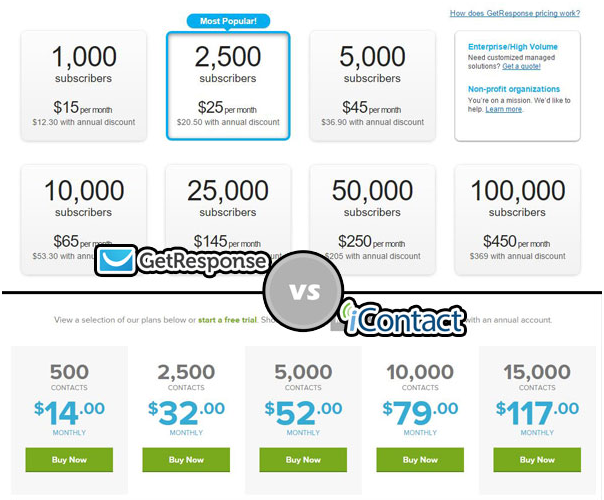 GetResponse charges $15 per month for 1,000 active subscribers where else iContact charges $14 per month for only 500 subscribers. So, the conclusion of pricing is iContact is almost double expensive than GetResponse. Internal interface of GetResponse is pretty colorful and attractive. It has all the options above the fold, which is easy to use. Just below the fold, it has showcase for each campaign as well as report on the last campaign. iContact also has all the options above the fold along with the total number of subscribers and number of sent emails which is quite good however, it seems to lack attractiveness. It also has all social media integrations in this page which is its unique feature. 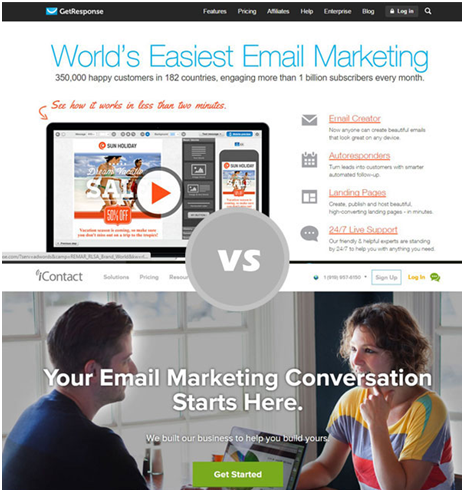 The basic setup is quite easy in both Email marketing tools. In GetResponse, just click the big blue button to add your contacts or go to Contacts &gt; Add Contacts. You can either add one by one or upload the whole list as CSV, TXT, VCF, XLS, XLSX or ODS file, which will save your time. Moreover, you can directly import contacts from Google docs, Salesforce, Zendesk, Google contacts, Magento etc. to GetResponse. To add contact in iContact, you need to go Contacts tab, then click on Add Contacts button in sub-tab. iContact also has the similar contact adding process, but doesn’t support direct importing from other sources like GetResponse. When it comes to third-party integration, GetResponse can integrates over 106 Applications and platforms including WordPress, Joomla, Salesforce, CLickDesk, MailSync, Google Checkout, Amazon payments and many more. You will be amazed at the number of Applications that GetResponse integrate with when compared with iContact. Third-party integration will enable hassle-free operation between the email marketing service and such applications and platform. For an internet marketer, third-party integration is extremely important. This way it is guaranteed that your email marketing provider will work out-of-the-box with your platform of choice. So, if you are looking for an Email marketing service that integrates well with lots of platforms and applications, then you should consider GetResponse. From my point of view, web forms are the zest of any Email marketing service as this is the vital way to collect Emails in order to build an online empire. Recently, GetResponse has introduced its new web form building tool which is incredibly amazing. Big red button of internal interface will lead you to web form building section. There are 500+ pre-design web forms, which can be customized very easily as per your desire. It also supports various list builder apps and plugins along with custom HTML web forms. On the other hand, iContact provides only custom HTML and Facebook web forms to collect Emails. Auto responder is must for series Email marketing which is the most important part of any Email marketing campaign. Either you are Authority blogger or affiliate product seller, except auto responder you are keeping most of your money on the table. 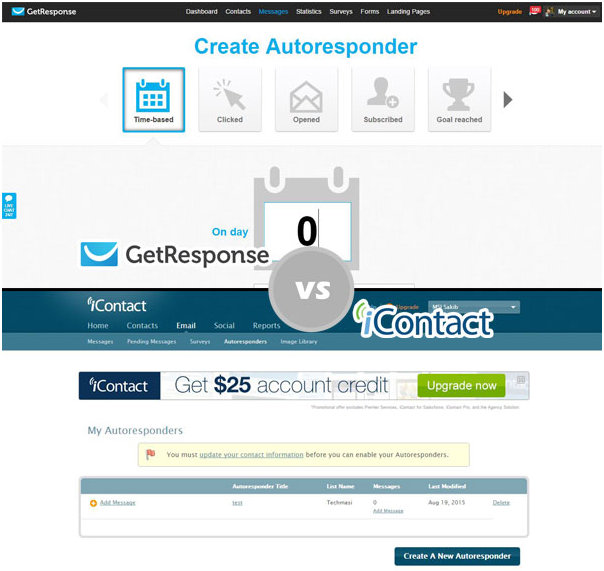 Both GetResponse and iContact has auto responder service and hundreds of pre-made templates which can be easily modified and used to setup auto responder system. The Landing page is the front entrance of making money through affiliate product sales. So, there isn’t any point of ignoring this essential part of Email marketing. There are lots of premium landing page providers such as Instapage, Leadpages, Thrive landing page and many more. However, you need to pay $25+ each month to use these premium and highly converting landing pages. However, you will be lucky if you choose to use GetResponse as it has hundreds of landing pages which can be used as the alternate of those premium landing page service. It’s very sad to say that iContact has no custom landing page service. Therefore, if you choose iContact you need to use those premium landing page builders or go with some free tools and plugins that are available in the market. I am pleased with the customer support of GetResponse as it gives reply rapidly during live chat. I contacted them several times for asking questions and every time I got the solution without wasting my time. Need to say that I used only its live chat support (24×7) with is enough to get instant help from GetResponse team. On the other hand, iContact also provides live chat and Email support but not 24×7. You can see its live chat period in the above image. Tracking inbox rate, click rate, open rate, number of unsubscribes etc. is the most important task right after sending Emails (Broadcast). 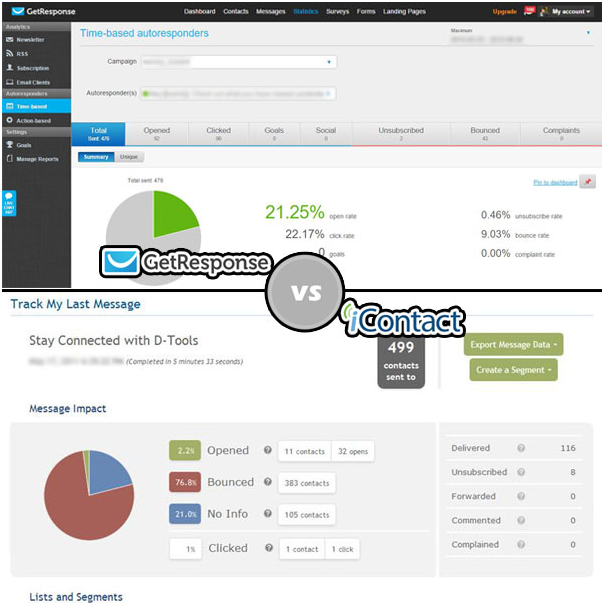 Both GetResponse and iContact present nice graphical report with detail statistics, which will allow you to track your Email marketing success. Why Getresponse is better option than iContact? It has its own landing pages which will save your money. 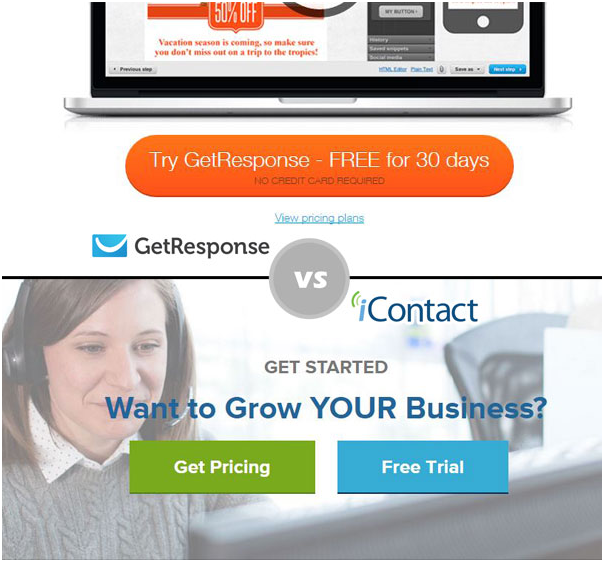 GetResponse provides free online serial courses to teach you collecting Emails like pros. Get 24×7 instant help via live chat. Perfect timing – This option will increase your open rate by sending Emails in the perfect time to your subscribers. Provide apps and plugins to enhance your Email marketing experience.